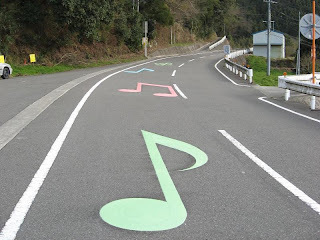 A team from the Hokkaido Industrial Research Institute has built a number of "melody roads", which use cars as tuning forks to play music as they travel. The concept works by using grooves, which are cut at very specific intervals in the road surface. Just as travelling over small speed bumps or road markings can emit a rumbling tone throughout a vehicle, the melody road uses the spaces between to create different notes. Depending on how far apart the grooves are, a car moving over them will produce a series of high or low notes, enabling cunning designers to create a distinct tune. Patent documents for the design describe it as notches "formed in a road surface so as to play a desired melody without producing simple sound or rhythm and reproduce melody-like tones". There are three musical strips in central and northern Japan - one of which plays the tune of a Japanese pop song. Notice of an impending musical interlude, which lasts for about 30 seconds, is highlighted by coloured musical notes painted on to the road. According to reports, the system was the brainchild of Shizuo Shinoda, who accidentally scraped some markings into a road with a bulldozer before driving over them and realising that they helped to produce a variety of tones. The designs were refined by engineers at the institute in Sapporo. The team has previously worked on new technologies including the use of infra-red light to detect dangerous road surfaces. But motorists expecting to create their own hard rock soundtrack could find themselves struggling to live the dream. Not only is the optimal speed for achieving melody road playback a mere 28mph, but locals say it is not always easy get the intended sound.